HDMI version 2.0b, which is the currently industry standard, requires 18 Gbps video bandwidth support. But a great many medium to long length HDMI cables that claim to fully support this in reality do not. The purpose of this thread is to provide a resource database, including lookup tables, with the results of comprehensive evaluation and testing of HDMI cables to reveal which cables will actually reliably and consistently pass 18 Gbps bandwidth video signals and hence properly support HDMI 2.0b video content. Where you can rest assured that these will every time fully and properly support HDMI 2.0b / 18 Gbps video signals; and hence if you use these cables you can kiss goodbye to all of your HDMI headaches and problems, for good. Troy LaMont, Kevin R. Anderson, rboster and 52 others like this. Last edited by ARROW-AV; 10-03-2018 at 06:55 PM. This thread will be a terrific source of info for years to come, thank you. Suggestion. I assume the actual report will be updated many times in the future. Perhaps add the date of the linked report to the file name so people can note an updated report from their last view/download ? Or perhaps a report version number, e.g V1.0. Last edited by Cain; 05-05-2017 at 03:08 AM. Great minds think alike! You will note that the report is labelled "REPORT #1"... The next will be labelled "REPORT #2"
"Technology is a drug. We can't get enough of it." Everything will then be covered, in that there is no need to go shorter than this because the "HDMI PREMIUM Certified Cable” certification currently covers cables up to 15ft/4.5m in length, but not any longer than this as of right now. alebonau and richlife like this. Last edited by ARROW-AV; 05-05-2017 at 04:24 AM. It's good to see there are reliable options that are not crazy expensive. It's also clear that there are no reliable cheap options at these distances. The old adage "all HDMI cables are the same" really does not apply for UHD and it is a shame that all the ancient articles arguing that point continue to come up in newcomer's searches and probably will for a few more years! I'm a bit unsure about your "additional" recommendation. It seems that although the Gigabit Accelerator was able to "fix" some, presumably borderline, cables, it clearly failed in a number of situations too. At it's current cost it only makes sense, as you say, when there are pre-installed cables that are hard to swap. Since a lot of pre-installed cables are likely to be quite old the failure rate might be very high! Personally, based on your results, I would call the Gigabit Accelerator section "Might be worth trying", rather than "recommended" and I would add that anyone trying this to make an old cable work should make sure they get it from a source with a good quibble-free return policy, as it is quite possible it will not work and you really do not want to be left with a $300 paperweight! Repost with more data and grammar correction (Grin - Arrow-AV quoted me too quickly.). System is Oppo 203 straight to JVC RS500 projector. *All results* still pending long term testing, and may not be applicable to your system. I merely want to add to the database. 1. Monoprice 25 ft: "Certified Certified Premium High Speed HDMI Cable, HDR" as described on ebay, $29. Doesn't work. Full refund given by official ebay Monoprice seller. 3. Generic No Name HDMI Cable 10 ft: Says HDMI 1.3 on the cable (!!). Don't even remember where it came from :-). 10 ft - Works perfect. That this cable works is key to me regarding high speed HDMI: for once in life, shorter is better LOL. Pending others' input, I would speculate therefore most generic short length cables should work for high speed HDMI function. 4. NEW Blue Jeans Series 1E 25 ft: This latest cable is labeled "High Speed HDMI Series 1E". Note the E. 25 ft - Works perfect. 5. NEW Blue Jeans Series 1E 35 ft: "High Speed HDMI Series 1E". Note the E. 35 ft - Works perfect. Very happy with this. 6. Generic 10 ft HDMI + HDFury Linker + Blue Jeans 1E 35 ft: For those, particularly JVC RSx00 (cheers), who use the Linker. Here Linker also acts as a bridge to extend connection to 45 ft - Works perfect. In number 6, my earlier "theory" of using Linker as a bridge to lengthen copper HDMI connection was tested and worked out perfectly. markrubin and ARROW-AV like this. My System & Theta Casablanca Mini-Review (CB IVa setup help HERE) Uncontrolled passion for music, and sound. JTR Subwoofer Thread I don't always listen to subwoofers, but when I do, it's JTR :-). Last edited by cannga; 05-05-2017 at 07:29 AM. This is an excellent resource! Thank you for the hard work. Given that long cables are often used in-wall it would be useful to know the specific ratings of the cable. For example, from what I can see two of the most appealing cable series (Monoprice and RUIPRO fiber optics) may not be explicitly rated for in-wall use. "However, a VW-1 rating does not necessarily mean that the cable is safe to run in wall"
Therefore, you don't have to run it in-wall. So if you are worried about doing so, then quite simply don't! Yes, those Monoprice cables clearly have some magic in them and I think it's great Fiber has come down in price. Somehow I suspect that ALL HDMI 2.1 cables will end up being fiber with integrated conversion at the ends, like RUIPRO, at least over 1-2M. Can't see how electrical cables are going to cut it. Sounds like there is some work to do to even get (consumer-priced) fiber to work at 48Gbps though!! Shhhhh! Don't mention 48Gbps! Everytime anyone does that I immediately go cross-eyed and suffer a spontaneous migraine headache! Best not to think about such matters! G-Rex, mikela, Kazz063 and 3 others like this. BrolicBeast and ARROW-AV like this. Thank you. As others have said, this is very useful information. Thank you. She's so fine, there's no tellin' where the money went! Great great report! Congrats and thanks. Cain and ARROW-AV like this. Last edited by Laserion; 05-06-2017 at 04:22 AM. Ran my 3 ft HDMI + Linker + Blue Jeans Series 1E 35 ft, all outside of wall without any problem. Got a taste of just how fickle long distance HDMI connection is: As my cable "snakes" from projector towards the BD player, at the player's end there are a bunch of other cables in the area: power cables, digital cable, internet cable, etc. If I lower the Blue Jeans towards other cables, I lose signal. If I raise the Blue Jeans higher to separate from others, signal comes back. I didn't want to test this too much for now because just wanted to leave well enough alone, but would add electromagnetic interference as one reason why these long, high speed, HDMI cables drop signal. I would think the prime suspect are the 110 v power cables/lines. While reading up on this topic, I came across a post in the past of someone testing with Blue Jeans 1E 25 ft that worked fine "outside," then stopped working once he pulled it through the ceiling (apparently a nightmare ); it was a puzzle to me back then. EMI as the cause makes sense out of this scenario. Difference between Blue Jeans *may* be that it has better isolation. Last edited by cannga; 05-06-2017 at 08:11 AM. ^^^^^ could the "lowering" of the cable be due to strain on the HDMI input and not necessarily EMI inteference? Would it be possible to disconnect the other cables as a test and just connect the HDMI cable and then move it up and down? Good point. No in my case there is no strain because the connection is a "loose" point, Blue Jeans 35 ft connects to HDFury which connects to SSP with 3 ft cable, hence connection of Blue Jeans to HDFury hangs loosely. In addition I did (unintentionally) test the strain at the projector pretty good - bending connector up and down there causes no loss. I am so elated that it works that I am not trying to reproduce the signal loss situation for now (blue screen once, and white noisy screen once, which nearly broke my heart ). This silly issue is so nerve wracking and if there were a single inventor for HDMI he should be fired :-). markrubin, old corps and ARROW-AV like this. Last edited by cannga; 05-06-2017 at 08:54 AM. Good point. No in my case there is no strain because the connection is a "loose" point, Blue Jeans 35 ft connects to HDFury which connects to SSP with 3 ft cable, hence connection hang loosely. In addition I did (unintentionally) test the strain at the projector pretty good - bends connector up and down there causes no loss. 1. Size of cable: 24 g of Monoprice vs 23.5 g of Blue Jeans Belden series 1. Doesn't seem big enough of a difference. 2. Physical bending: perhaps in severe case and not in my case. 3. Signal loss from length: A few feet difference? Just doesn't seem likely but I could be wrong. 4. Signal integrity affected by length: EMI being the devil. Of the 4, EMI seems to me the most likely candidate of how things get messed up with long distance HDMI. We know long distance RCA cables pick up hum, it's not too far fetched IMHO to make this connection to HDMI. All speculative of course and yes I hope that white screen gremlin moves onto the next unfortunate victim . I bought 2 Blue Jeans to test, 25 ft and 35 ft, was going to return the 25 ft but ended up running it parallel to the 35 just in case LOL. The headache is not just worth it and plus I am hoping to have calibrator extraordinaire @Chad B coming to calibrate so can't take a chance! Last edited by cannga; 05-06-2017 at 11:00 AM. I just bought the 33' RUIPRO from Amazon. We'll see if that works when watching Billy Lynn's Long Halftime Walk. Of the 4, EMI seems to me the most likely candidate of how things get screwed up with long distance HDMI. We know long distance RCA cables pick up hum, it's not too far fetched IMHO to make this connection to HDMI. All speculative of course and yes I hope that white screen gremlin moves onto the next unfortunate victim . It's a good idea to keep both cables, just in case. 10' may be the difference. It will be interesting to see what Chad has to say. Good luck! Great report, thanks for all of your hard work, looking forward to the next report. I'm happy to see alternatives to the Celerity cables as mine worked for about a month and then stopped working at full bandwidth, not what I had hoped for at that price given that they are $400 here in Australia. Very sorry to hear that, but surely you can just get it replaced under warranty? The distributor here were dragging their feet on "testing" the faulty cable so the retailer refunded me and will deal with the distributor, so all good here. jong1 and ARROW-AV like this. Ran my 3 ft HDMI + Linker + Blue Jeans Series 1E 35 ft, all outside of wall without any problem… Got a taste of just how fickle long distance HDMI connection is: As my cable "snakes" from projector towards the BD player, at the player's end there are a bunch of other cables in the area: power cables, digital cable, internet cable, etc. If I lower the Blue Jeans towards other cables, I lose signal. If I raise the Blue Jeans higher to separate from others, signal comes back. I didn't want to test this too much for now because just wanted to leave well enough alone, but would add electromagnetic interference as one reason why these long, high speed, HDMI cables drop signal. I would think the prime suspect are the 110 v power cables/lines… While reading up on this topic, I came across a post in the past of someone testing with Blue Jeans 1E 25 ft that worked fine "outside," then stopped working once he pulled it through the ceiling (apparently a nightmare ); it was a puzzle to me back then. EMI as the cause makes sense out of this scenario. Difference between Blue Jeans *may* be that it has better isolation. Nice idea and whilst we are not saying the it is not possible that EMI may possibly contribute to some degree in some instances towards an HDMI cable have issues passing video signals, please kindly note that with respect to all of our tests in all instances all cables were tested as 'PRE-INSTALLATION' in other words, NONE were installed into walls or ceilings; and the environment has one of the lowest/non-existent EMI you can possibly find within a residential environment. (Happy to elaborate if you wish). question about shorter cables that reliably support 18GBPS… I need 12-15 foot cables to connect a Kaleidescape Strato and OPPO 205 to a Sony 940D… 10 foot cables work fine but when I go to 15 foot length, only the certified premium cables work: and they are too thick/heavy: a slim cable would work but I have yet to find one that is certified premium… any suggestions? Hi Mark, We would recommend the 6m long RUIPRO. 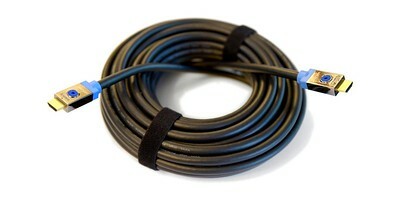 Whilst you don't need it 6m long the cable is highly flexible, very thin, and 100% reliable. It’s perfect for your needs. Regarding the premium certified cables, we would like to know more regarding precisely how and to what extent these cables are tested, plus wait to hear a sufficiently considerable quantity of feedback from users, plus carry out some of our own tests, all of which before we ourselves will personally be vouching for these cables. That said, we should add that same applies to fibre optic HDMI cables in general, in that whilst it is definitely the superior technology regards succeeding in reliably delivering 18Gbps, it cannot be taken for granted or assumed that any and all fibre optic cables will deliver the same perfect perrformance as eachother, because we have already determined that there is a significant variance in performance between the various fibre optic technology based HDMI cable products that we evaluated and tested, and so there is still the need to cherry-pick the cables which are confirmed by tests and/or indicated by user feedback to be the best performing. Cain, cannga and markrubin like this. Last edited by ARROW-AV; 05-07-2017 at 04:54 AM. 13059 Attachment(s) The "Official" Crowson Tactile Motion Actuators Thread.